Not only was the lecture well-attended and involved significant class input, but it also featured some unexpected guests in the person of several communty managers of Linden Labs, the makers of There.com competitor Second Life. 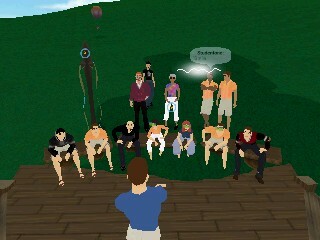 (Pathfinder Linden is sitting third from left on the bench, looking remarkably like his Second Life self). They were able to shed some light on DR in Second Life. Also notable for this session was that we finally got voice working for everyone, thought text-chat was still preferred for offhand comments and even most audience questions. Despite the fact that this would probably the most MUVE-savvy group we’ve ever had, Lauren still spent a good 15 minutes helping participants set up, mostly because they needed to inhabit avatars that were preconfigured with voice. Because we’ve yet to achieve a stable, repeating group, every session seems to involve some amount of technical setup. I’m not sure there is a way to avoid this given the ad hoc, day-by-day nature of the Academy presentations. edit: Unfortunately, I neglected to record this session in either audio or video. Another big disadvantage of voice over text is that it’s harder to memorialize meetings in a usable format. It’s relatively easy to scan the text of a chat to find interesting bits or reread confusing part, but listening to an unedited MP3 stream may not be as accessible. I know of some efforts to bridge text and rich media — Illinois Legal Aid Online, for example, manages to not only videotape but also transcribe to text their trainings — but it’s not a cheap or logistically easy operation. Perhaps one day with better (and cheaper) speech recognition software we’ll get there. Posted by Gene Koo on Wednesday, September 27, 2006, at 3:16 am. Filed under project: State of Play Academy. Follow any responses to this post with its comments RSS feed. Both comments and trackbacks are currently closed.